Syringe Needle Destroyer is an electrical device, designed to destroy the used disposable needles and cut the disposable syringe nozzle easily. It ensures that the health care workers is not required to touch the needle while disposing off the same at the point of use, thus providing adequate safeguard against accidental pricks which may even result in loss of life. 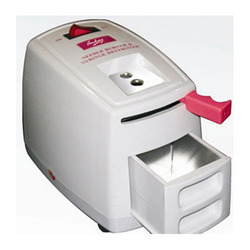 It is quick and portable device which sterilizers the destroyed needles for total safety. Nozzle of the syringe is cut after the needle is destroyed. Available in 1.5 Lt. or 3 Lt. made of all S.S. material. Unpack the equipment and check the functioning by plugging it into a 3 pin 5 Amps 230 V electrical socket. Ascertain the dos'age required for the room to be disinfected. Place 'OT Fumigator' inside the operation theatre. Pour in the formation & water into the dish from sides. Close and seal all the windows, ventilators openings and the door of the place to be disinfected. Plug in the unit's main cord into a 3 pin, 5 Amp, 230V, electrical Sockete or use automatic timer. 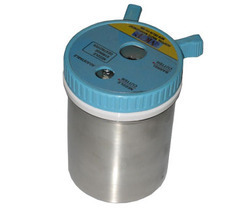 Switch on the 'OT Fumigator' and allow it to run for 30 minutes thens with switch. Which must be provided outside the operation theatr switch it off. Wait for 6 hours and open the room before re-using the room, exhaust remaining fumes if any by switching on the fan / exhaust of the window and airconditioner. Our products have excellent specifications, a reliable performance, and offer good value for money. We are committed to continuous R&D by investing as much as 10 percent of our earnings in R&D. Para is 5 parameter monitor with 12” colour TFT. User friendly menu driven settings through encoder. 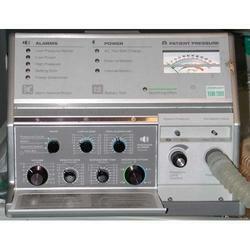 It is used in ICU as a bedside monitor. • Parameters are as follows,  3 ECG channels  SPO2  NIBP  Respiration  Temperature 1. General Dimensions : 276mm X 336mm X 161mm (H x W x D) Weight : 5 Kg. with in built battery.Display : 12.1” Color TFT LCD Resolution : 800 x 600 pixels User Interface : Encoder 2. Power supply Input voltage range : 150v-270v AC, 50 / 60 Hz (+/- 5 %)Battery type : 12v/4.5AH (in-built)Charging time : 80% charging in 12 hrs (typically)Backup : 3hrs on full chargePower ratings : 40w.3. Environmental Operating Temp : -5 ºC to +40 ºC Humidity : up to 95 % non-condensing. 4. 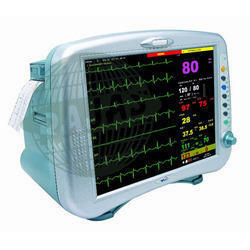 ECG Frequency response : 0.5 Hz to 35 Hz Lead selection : Lead I, II, III, aVR, aVL, aVF and V Heart rate range : 20 to 220 bpm. Gain setting : 0.5, 1.0, and 2.0. CMRR : > 90 db. Sweep speed : 12.5, 25.0, 50.0 mm/S. 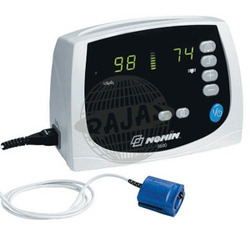 Accuracy of HR : +/- 1 bpm Data output : RS232 output of ECG, SpO2, NIBP and Respiration & Temperature 5. SpO2 Range : 0 to 100 %. Accuracy : +/-2 %, (70 – 100% of SpO2) , +/-3 % (50 – 69% of SpO2) 6. NIBP Method : Oscillometric Range : 20 to 230 Time interval : User selectable 3 min. to 250 min. Modes : Manual and AutomaticCuff : Single tube with Velcro. The offered product is ideal for cutting off syringe hub or destroying syringe needle into ashes so that it cannot be used again. The needle cutter is made using rust-proof stainless steel that make it suitable for long term usage. Integrated with removable discharge tray, Needle Syringe Destroyer is widely acknowledged in the market for its excellent performance.Features: Low power consumption Compact design Shock proof Low maintenance Table SIZE 165mm x 115mm x 120mm Handy desktop model. 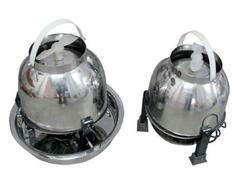 WEIGHT 1.7 kg POWER 220 voltage 50 hertz, single phase. PROTECTION 2 ampere 3/4 cartridge fuse.unit made of ABS body light weight ON and OFF switch provided with powder cord, marking for use of the unit, handy. Manual Needle destroyer body made of stainless steel and LID made of Hard PVC with Blace made of stainless steel to cut the needle and the Nosal of the syring, easy to operate , very handle light weight and easy to operate knob operation sharp blade which allow very easy cutting of needle and nosal of the syring, lid removable with screw thread type locking, easy to clean. Backed by long years of industry expertise, we offer to our clients variegated range of surgical appliances such as Minor Anesthesia Apparatus ( Item Code: O.T.E-03). This is a surgical instrument used by the hospital doctors and surgeons during surgical operations of the patients. 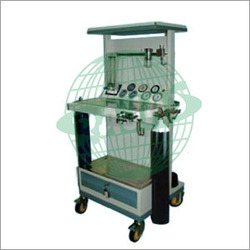 Equipped with varied safety provisions, these instruments suit the specific type of clinical operations. We fabricate our entire gamut with medically certified accessory parts to ensure its excellent functionality and low maintenance costs.